The summer of 1789 heralded the arrival of dark days for many in Britain: revolution in France, the Russians were on the march in the east, and the swearing in of an American president seemingly confirmed that the former colonies would not, as had been widely predicted, collapse into anarchy. 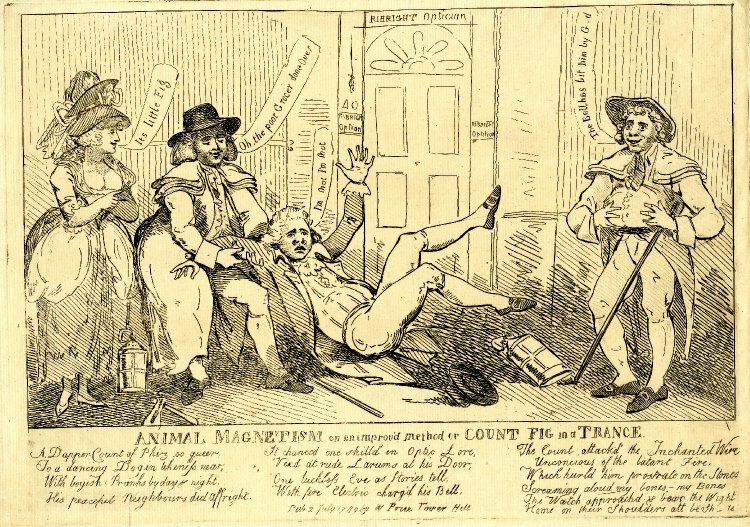 But for the residents of the Poultry in London, the long summer of 1789 brought a new terror: the threat of a disturbed night’s sleep. Throughout June of that year the occupants of this oddly-named thoroughfare had been woken by the sound of someone knocking loudly at their doors during the dead of night. Inevitably this mysterious caller would always vanish before the householder had chance to answer the door, and speculation about his identity quickly became rife throughout the area. After being awoken on several occasions by the sound of someone ringing his front doorbell during the small hours, Thomas Ribight of 40 Poultry hit on a novel idea for unmasking this nocturnal nuisance caller. Ribright was an optician and manufacturer of scientific instruments of some renown; he was also a keen amateur scientist and had recently completed a number of experiments on the conductive properties of different metals when exposed to a strong electrical current. Before retiring to bed one evening he sprinkled a large quantity of tin filings over his front doorstep and connected a length of copper wire to handle of his doorbell. The other end of the wire was connected to a Leyden Jar, a sort of primitive battery, which Ribright had charged with a large charge of static electricity. With his trap set, he duly took himself to bed and fell into a fitful sleep. Sometime later he was awoken suddenly by the sound of a loud scream at his front door. Running downstairs, he threw the door open and saw the figure of Peter Wheeler, a neighbour, slumped in the doorway clutching his hand in agony. Wheeler was a well-known figure in the Poultry; a successful grocer and tea-dealer who had been nicknamed ‘Count Fig’ by his neighbours on account of both his wealth and the affected airs and graces he had adopted since coming into money. Wheeler had subsequently quarreled with several of his neighbours, including Ribright, and decided to get his own back by sallying forth at nights to knock them from their beds. The little grocer eventually managed to stumble to his feet and, assuming that he had been the victim of some lethal assault, yelled “What! You shoot people eh?! Damn ye!” before staggering off in the direction of his home. 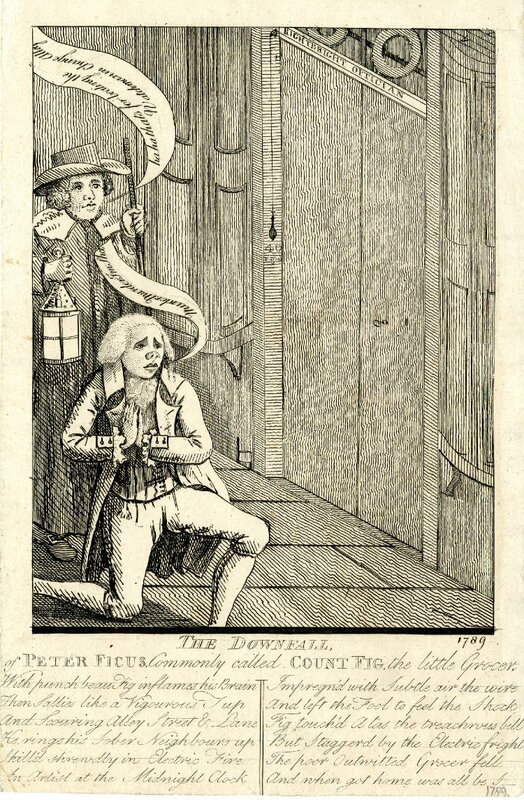 The noise alerted a number of passersby, including members of the city watch, but on learning the reasons for Wheeler’s predicament, they too decided to enjoy a laugh at the hapless Count Fig’s expense. 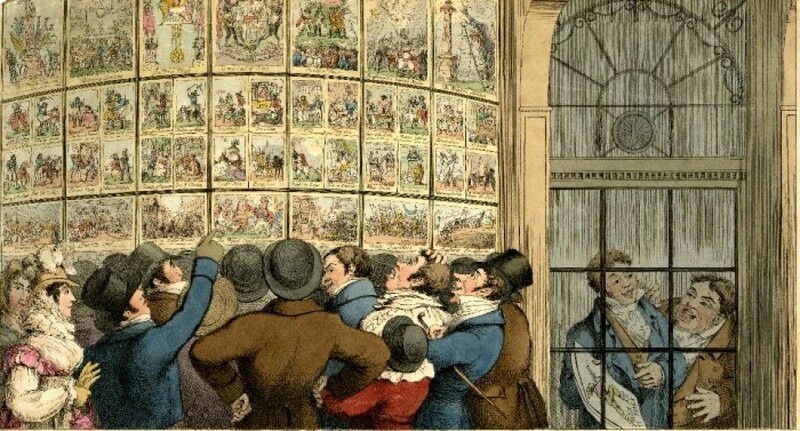 Two other prints, almost certainly both the work of by the same artist and publisher, were also produced anonymously around this time. The first of these was The downfall, of Peter Ficus, commonly called Count Fig, the little grocer, which also shows Fig in the moments after being electrocuted. 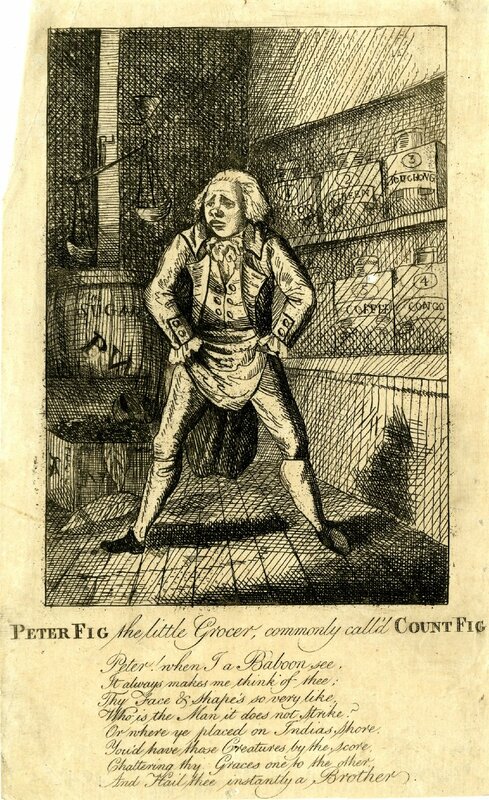 The second, Peter Fig the little grocer, commonly call’d Count Fig, has been more carefully engraved and was presumably produced at a slightly later date in order to capitalise on the on-going interest in the subject. It shows Wheeler striking a rather ridiculous pose in his shop and contains a rhyme which compares his features to those of a baboon. The public’s interest sparked a rash of increasingly fanciful accounts of the incident which Ribright himself eventually felt compelled to correct. On the 8th July 1789 a letter appeared in the Times, stating the facts of the matter as relayed here and stating that the author was willing to swear an affidavit to that effect if needs be.